I’m still recovering from the gigantic feast that was Thanksgiving over at Somer’s house. You can get the (long) list of delicious plant-based dishes here. Other than at the buffet at Bellagio in Vegas, I’ve never before seen so much food. So even though I’m giving my digestive system a much-needed break, I’m still thinking about the macadamia nut brie, the mashed potatoes with mushroom gravy, the rolls, the sweet potatoes, the mini cashew-rice loaves…and…the dessert table. Yes, dessert had it’s own table. In fact, it spilled over onto two tables. There was a beautiful raspberry pie, two pumpkin pies and an incredible chocolate peanut butter tart from Amanda at Good Clean Food. There were also my contributions, including the one pictured above. A big spoon and I could have made quick solo work of the whole thing, but I was compelled to share because that is what Thanksgiving is all about. Please make this recipe. It is outstanding and it comes from the creative mind of Gabby at Veggie Nook. Don’t let the humble name – No-Bake Pumpkin Mousse Cake – fool you. It’s special. And cuz it was a holiday I made it extra special and topped it with coconut creme. I also made two apple pies; recipes based on a walnut-crusted pie from the pages of the November 2012 Cooking Light magazine. I added dried, tart cherries to one of them just for fun. I also brought along a hazelnut pumpkin cheesecake with a chocolate-hazelnut topping. The recipe is a mish-mash of several cheesecake recipes – and I’ve included it below. This turned out to be a big hit with the kids, I think because of the chocolate on top. Place cream cheese and ricotta in a large bowl. Beat until smooth. (I don’t have a hand-mixer so I mixed mine in my Vitamix blender). Add the maple sugar, vanilla, egg replacer mixture, cinnamon, allspice and salt. Beat until very smooth. Stir in the pumpkin puree. Pour the batter over the top of the cooled shortbread. Bake for 1 hour or until the center of the cheesecake barely moves when touched. Remove from oven and run a knife around the edge. Cool on a wire rack then cover and chill for at least 8 hours or overnight. Remove the cheesecake from the pan and place on a plate (if you’re really skilled, remove the bottom part of the pan, too.) In a small saucepan melt the chocolate chips, the nut butter and coconut oil. Pour over the cheesecake and chill ‘cake again until the chocolate sets. In a large bowl, combine the agave nectar, miso, vinegar, nutritional yeast, salt and almond milk. Crumble the tofu into the bowl and add the cashews. Stir until everything is well-combined. Use immediately or store in an air-tight container in the refrigerator. I’m making one to bring w/ us for Christmas ;-). We ate like kings and queens! Just check the label of the cream cheese to make sure there’s no soy in it. Look at that -drooooooollll – what a feast!!!! I was never a cheesecake fan until I went vegan – but now I love it. Thanks, Anne! mmm…any other uses for the sweet ricotta? hmm. I would have never thought of that. Thanks! That mousse tart looks ridiculously good! Also… can I just eat the sweet ricotta with a spoon, please? Barb, the mousse cake…oh my gosh. It was dangerous! Wow I wish my oven was working now just to make that Hazelnut Pumpkin Cheesecake. It looks amazing! How did you ever get all those desserts to Somer’s? *without taste testing them along the way). What?! What’s up with your oven? You need to do a raw version ;-). It took great restraint not to dive into those sweets! Yea, I’ve just been stubborn for almost 2 years now and haven’t called a repair man to fix it. The stove top works and the oven is now filled with lots of ‘kitchen’ items I’ve acquired so……it’s not that bad without it actually between crock pot and dehydrator. Maybe a raw version but your’s looks so nicely browned and all I’d just be disappointed I think. Still trying to get over not being able to enjoy your Pumpkin Flat Bread without the whole wheat 🙁 Have to try the Hazelnut sauce though for sure ! The pumpkin cheesecake looks so incredibly good (although it all looks good)! I can only imagine how tasty your Thanksgiving must have been with all those goodies! Absolutley delicious looking round up of goodies Annie! Sounds like it was quite the giant feast 🙂 I think I need to head over to Gabby’s blog and get that recipe down! Holy moly! Looks like ya’ll had a friggin delicious gratitude day! Yum! Wow! There’s a lot to be thankful for right here in this post! In our defense, we were feeding a LOT of people. And most of us left with food to take home :-). I’d love to hear what your menu is for Christmas! Now that sounds like a true Christmas celebration. Right down to the snackies. I love that idea! You always have the most beautifully, mouth watering desserts! I wish I was at your T-Day table! Oh, that would’ve been fun! I’m so happy my cake was such a hit!! I bet it was extra good with your special touch 🙂 Your cheesecake sounds amazing too! You had quite the selection at your Thanksgiving, I’m jealous! It’s really an outstanding dessert, Gabby. Include that one in your cookbook ;-)! Oh my, I feel rather hungry all of a sudden. Then I have accomplished what I set out to do :-)! I didn’t get a chance at the berry pie – just couldn’t squeeze it into my belly, darn it! Dessert is always the best part. ALL of this sugary goodness looks so good. I just stole some photos from this post for the Thanksgiving post. Hope you don’t mind since I really didn’t get permission first 😉 Of course they all link back to you. 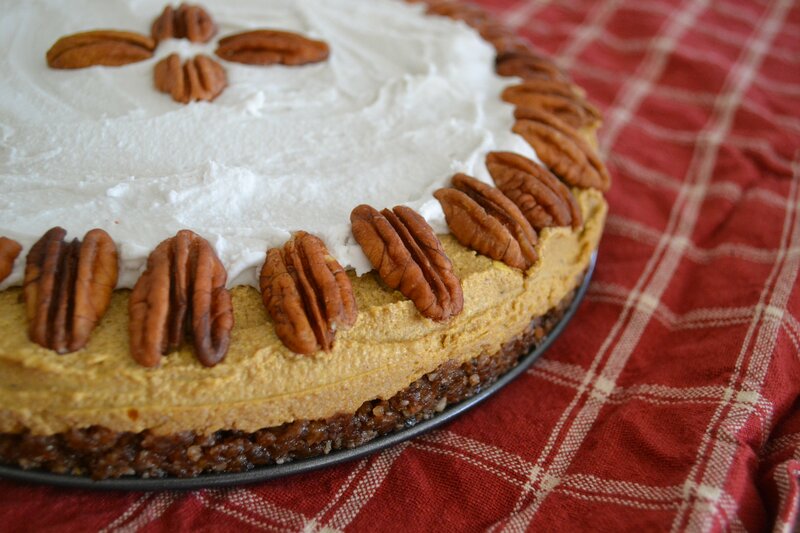 I’m way far behind on all of my blog reading, but my lord, that pumpkin mousse pie is glorious! Wow! Kristy…seriously…you must make this. I wish I could take the credit for this baby, but it’s all Gabby. I think I’m making it again for Christmas…and there will only be 2 of us eating it!